The crew and I spend the night at Starlight Solar. Our work was not completed by quitting time. The next morning we’re bumped out of line because a couple getting three panels put on their 40-foot motorhome have an 8 o’clock appointment. We’re not leaving until our solar is in tip-top shape. Larry tells me that his people probably won’t get back to my job until after 3 o’clock. I look online and find there’s a Walmart a few miles down 32nd Street, so off we go, towing the Casita along with us. It’s an easy trip and an easy park. I stock up on lots of groceries because as soon as the solar is done, the crew and I are going to dry camp north of Yuma. Finally, we get the signal to pull up to the concrete pad alongside the building. That’s when I notice my propane tank cover. The lid is gone! Oh, no. I must not have tightened it enough. Darn! Where in the world will I find another one? I’m going to have to call the factory in Rice, Texas, and arrange for it to be sent to a post office box. That is, if I can order the part. This is really depressing! It looks awful without it. By the time the solar work is done, the sun is setting. Larry offers his parking lot for us to spend another night. I take him up on it. I’m not going to search for a dry camp location while racing against the setting sun. I know that several readers are interested in my solar. I promise to write about it. Right now I’m weary of talking about and hearing about solar stuff. Suffice it to say, I have 12 volt and 120 volt in the Casita and I’m getting the solar energy that my 200 watt panel is capable of. Hooray! First thing in the morning, I take the crew for a walk as usual. Hmmm…. If we retrace part of the route I took to Walmart yesterday, maybe I’ll see the propane lid alongside the road. Spike and Bridget are good sports. We walk a long way, checking one side of the road going away and the other side coming back. No luck, which isn’t surprising as we only walked a small fraction of the distance to Walmart. I’m kicking myself for being so careless. Oh well, we leave Starlight Solar to find a new camp! On the way down 32nd Street I notice an RV parts place. Maybe I can get LED lights here. Then I won’t have to order them. I park, get out and walk over to the entrance. I see it’s a specialty store for RV water supplies. A little cleaning and it’s good as new! I turn to go back to the PTV and there it is. 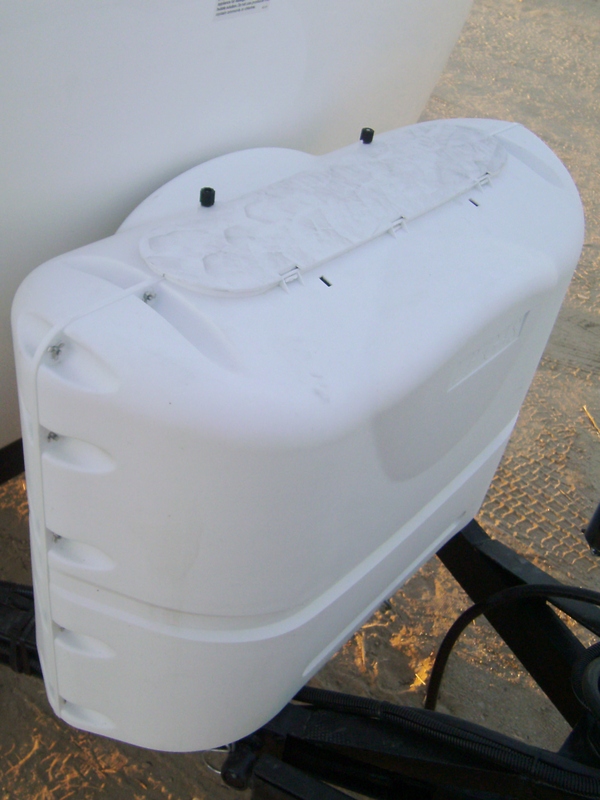 . . the lid for my propane tank cover! There’s about ten miles of road, if you consider both sides, that it could have landed along, and I pull over right where it rests. I happily secure it in place, hop behind the wheel, and go grinning on out of Yuma to our next camp. Today is New Year’s Eve day and it’s a Saturday. I’m not surprised to see campers around the pond, as well as people who came in their vehicles in order to picnic and fish. It’s a beautiful day in the mid-seventies. I drive us down one side of the lake but about halfway I see there are low, overhanging branches and the road turns to mud. I back up about five trailer lengths to a place where I can back in to turn around. I try the other side of the lake and find a sunny, level spot. The crew is anxious to explore this new place. I am, too! I love a camp next to water! Of course, Spike has to jump in, too! 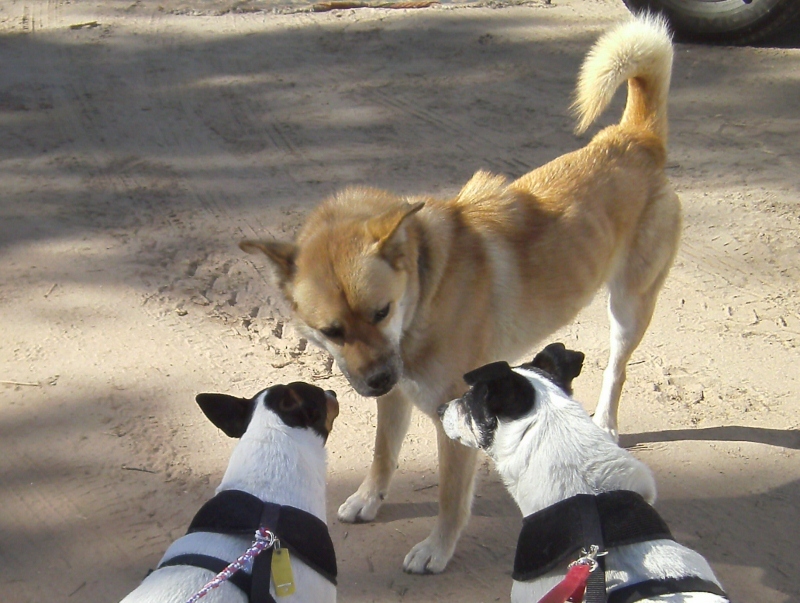 Bridget and Spike meet a dog with only three legs, and politely pretend not to notice. Somebody loves this dog very much. There’s a 14-day camping limit here. Temperatures are predicted to stay in the upper seventies. What a great way to start the new year! And what a great year it has been! Now that the sun has gone down, it’s cool. The night sky is clear and many stars are in view. Camp fires glow around the pond. Bridget and Spike are ready for bed. It’s time for me to send you this sincere wish . . .
May you enjoy good health and safe travels in 2012! This entry was posted in Getting Ready To Go. Bookmark the permalink. My granddaughter Allegra is sitting here on my lap and she has made me scroll up and down to see the doggies about 10 times now. My oh my she loves your doggies! What a lucky gal, finding that lid to your tanks!!! And getting your solar up to snuff is just the frosting on the cake. What a way to start the New Year! How cute! You must be enjoying your granddaughter very much. Yeah, what luck! I park right where it landed. What a story book day with it all coming out very nicely. I am envious of your campsite tonight and think it is a perfect way to start your 2012! A storybook day . .. . I like that! I never doubted for a minute that “things would work out.” This is the perfect life for me. I hope all is well with you down Mexico way . ..
Where is that pond so I can mark it on my maps??? Here’s my dilemma . . . . I believe in sharing and helping people enjoy life. I’m in a bit of a predicament though. I wouldn’t know where this place is if a person didn’t tell me. That person doesn’t want it blabbed all over the internet so it’s ruined. . . . Like I said, I would just as soon tell the world, but then again, I wouldn’t know where this place is if this person hadn’t told me . . .
Give me some time to sort this out, okay? Sue, your luck with the lid and with a good working solar setup is a fitting end to 2011. Let’s go into the New Year with enthusiasm and optimism, despite all the predictions of imminent economic meltdown. I wish you all many breakdown free miles and lots of smiles all the days of 2012 !!! What nice sentiments, Bob . . . and good advice to all of us for the new year. I know for some people it must be particularly difficult to be enthusiastic and optimistic about the future. All the more reason for those of us who can have a bright outlook to do what we can to bring light to others. I like your wish for me . . . the same for you, Bob. This is a fabulous campsite. How DO you do it? I want to be right there with you! CONGRATULATIONS on finding your cover! Now that’s the universe working for you for sure. Happy New Year to you and the crew! I could not believe my eyes when I saw that cover. The funny thing is . . . I didn’t park in front of the store I was going to. I parked in another area so I’d be sure to have room and that’s where I found the lid to the cover. It does seem like it, doesn’t it. Actually, if you knew my history, you’d know that I wasn’t born under a lucky star. Maybe I have a guardian angel? Better not analyze too much, just be happy! Oh Sue, I am sooooo happy you found ‘the spot’. Now shhhhh !!! LOL I miss it so. I hope you enjoy it as much as we did. When people asked me where it was on my Blog – I just said ‘outside of Yuma’. Me Bad wanting to protect such a gorgeous piece of paradise. BUT I don’t want to put you in any dilemma – you do what feels right for you. Sure wish I were there with you enjoying the scenery and watching our fur kids play. AND what luck finding your propane cover. Yup, ‘Tis a good life !! I can see why you don’t want it publicized. It’s already showing signs of too much wear and tear along the edges of the pond where the birds feed. Still a pretty place though! Thanks and best wishes to you for the new year! Was worried because you didn’t blog for a day or so and I was anxious about the solar repair. Bet you didn’t think you’d be writing a blog full of ‘suspense’ for your readers. What a year you’ve had, and now you get to start the new year living the dream. Please give your furkids a big squeeze for being nice to the 3 legged one. There are days that just aren’t inspiring, like hanging around a solar place. After a day of that I don’t feel like rehashing it all in print! It has been a fantastic year for me. I started out working in the rat race and ended up footloose and fancy free! Have a happy new year! HI Susan. Wishing you a very happy and safe 2012. I’m really loving your blog here and seeing all the pictures. And I love having you along with me and the crew! Wish you a wonderful year ahead . ..
Great spot Sue and HAPPY NEW YEAR. I hope we get to cross paths again. You are a nice lady and fun to visit. And you’re a nice man who’s not old and not fat! I’d love to see you again. I still check your blog every day. Hi Sue! 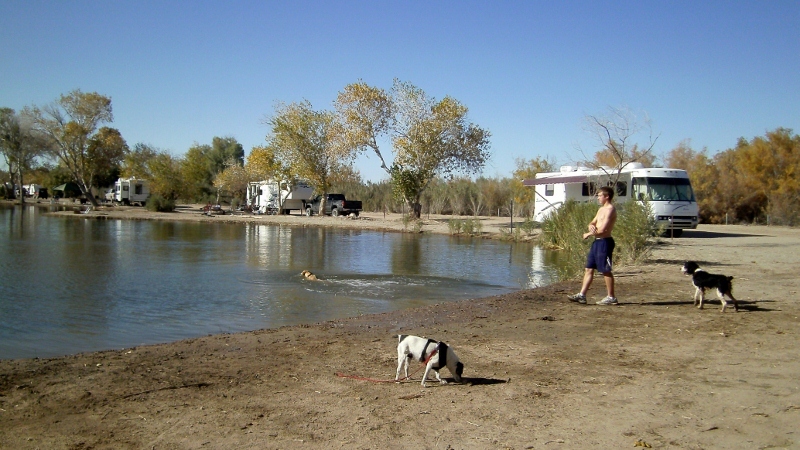 We’re camped about two and a half hours from where you are, at Indio, California. We want to get over to Yuma some time in the next couple of weeks. Darby Wells, is also on our list of places we want to check out. We need to be here for a dog show on January 7th, or we would probably head that way tomorrow. We aren’t exactly sure what we are going to do yet and will have to think about it some more tomorrow. We would like to meet you, but I understand that you promised your friend not to divulge the location of their favorite spot. Hey, I’m glad you found the cover to your propane tanks! I’ll make sure ours is tight before we leave here! I bet out paths will cross someday. The weather is wonderful here, of course. No wonder so many people spend the winter here. Yeah how about that lid to my propane cover? One of life’s mysteries . ..
Best wishes as you start the new year! Happy to see you stayed in the Yuma area. We do want to meet you. Understand you don’t want to divulge the location. Rest assured we aren’t looking to come camp there. We don’t boondock. We’re parked with our 5th wheel in the Foothills, just having arrived today. Please email me privately and lets figure out how to meet. I’d love to see your little Casita. And I’m sure my little dog would love to meet yours. Hi Sue, Glad all worked out…though it usually does for you!!!! Beautiful camp spot! Went to Groovy for anniversery and great blue grass band. HAPPY NEW YEAR from wee’uns and the hound herd to Bridgette and Spike!! Sounds like you had a groovy time! Whoo hoo! What a fantastic way to end the year. I am so glad you found the cover. It’s not even just having to buy a new one that would make you feel down but just losing it like that. So serendity stepped in and saved the day. Glad you got the solar worked out too. Can’t wait to hear more about that as you are leading the way for those of us who don’t pretend to be technical experts. Happy New Year. Happy new year to you! I’m glad you keep coming back to my blog . .. Happy New Year to you. Congratulations on finding a wonderful spot to hang out for a couple of weeks to start the new year. Sounds like you are exactly where you wanted to be by now. What a wonderful completion to 2011. We are all eagerly waiting to see what adventures you have in 2012. May you have a blessed, peaceful and safe New Year with just enough challenges to keep it interesting. Best wishes to you and your family! Oh, I’m sure there will be challenges. . . and lots of adventures . .. While in Yuma, take time to check out the old historic downtown, including Lute’s Casino (if it’s still there). In January they have something called the Lettuce Festival, and it’s a fun street fair. Also, the Army parachute folks practice in the desert in January, which is quite something to see – they are called the Golden something or other, and I’m sure the locals could direct you. We just stumbled upon their practice while on a ride, exploring the surrounding area. And don’t miss the flea markets. There’s one in the Foothills devoted to the well to do RV’ers, and another huge one for locals, near the center of town, where you can get some great fresh fruits and vegetables. Have a great time in the town where we spent the first two years of married life while my husband was stationed at the Marine Corps base – just seeing the name ‘Yuma’ brings back happy memories. 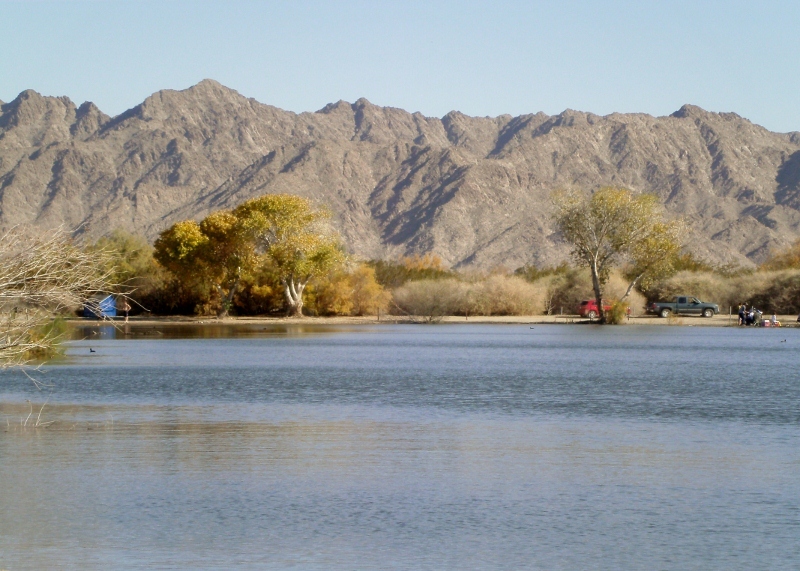 Thanks for all the insider tips on what to do in and around Yuma . . .
Well, I guess I am Waaay confused cause I thought the work your neighbors and you and the other guy did installing the solar was finished. Now we find out you have had to go see someone else to finish it? Yep, I’m confused. I hate that you are confused, all because of lil ol me. I’ll get you straightened out one of these days! Happy New Year Sue. It has been such a treat following you and the crew. It’s karma, you know, that you find such a wonderful camping spot after sorting out your solar issues. It’s perfectly alright to protect the confidence of a friend and not disclose favorite spots shared with you. When you confirm the trust placed with you others will be more likely to share their spots with you knowing their precious secrets are safe with you. Finding your lid; priceless. Hugs to the crew. Pictures are worth a thousand words. Kind, understanding words. Thanks. You always seem to know the right thing to say! Sue, It looks like you you are on your way to a “Happy New year”! I have to agree with everyone else that you have found a wonderful campspot. That will make for a serene cup of coffee in the morning. If the warm weather keeps up you will have to start the “sun tea”. 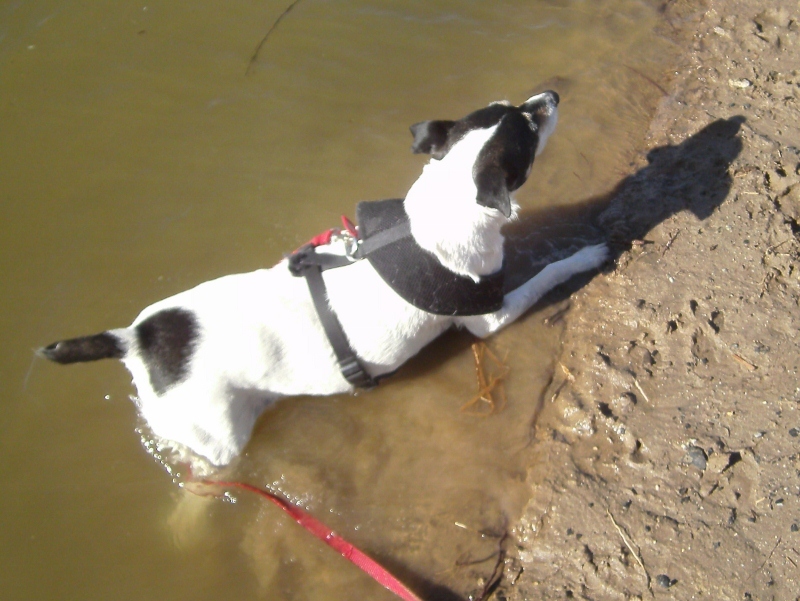 I would have trouble keeping my little Jack Russell (Daphne) out of that water, she would be in heaven just as your little ones are. Glad you are up and running solar wise. Enjoy your stay and can’t wait for the next blog entry. Because, when hubby and I open up our summer RV, the very first thing I do every morning, rain or shine or even snow once in a while, is get my big mug of hot coffee and sit on the deck in my rocking chair. I watch the sunrise, and the horses in the pasture and even the Elk who might still be out in the open. WOW ! Life is good in your camp. Happy New Year. We are headed towards Yuma and can only hope we find the same fortune on our journey. Thanks for sharing the pictures, it is almost as if I could feel the sun and water. You’re welcome, Susan. I hope you have a great trip! Happy New Year to Sue and Crew! Love your new camping spot! Happy New Year to you, Chuck and the canine herd! Wishing you and your canine crew the Happiest of New Years. I started following your blog a couple months ago and wait every day to see what’s new. Thanks for all of the pictures and well-written stories as you experience each new day. Hopefully one day we’ll be out exploring as well. I’m so glad you are reading my blog and enjoying it. I wish you the best and may your exploring days begin soon! Great Camping spot. Beautiful place to bring in the New Year. Maybe this New Year bring you many safe travels and wonderful new places. I wish you the best of everything for the new year, JoJo! I hope you have a wonderful, safe year in your travels with the crew. Maybe we can meet somewhere down the road again. Thank you, Jim. Best wishes to you for a happy, healthy and safe year! Wow, what a place to offer you nature’s “star” fireworks on New Year’s Eve last night and every night, with water at your camp sight to keep Spike happy too. Water must not be too cold? May your travels be more uphills, little down hills, and lots of valleys for rest and observation times. Thanks, Emily, for that new year’s wish. . . the same to you! Glad you finally have solar the way it should be……waiting to hear what the solution was. I absolutely love my solar. 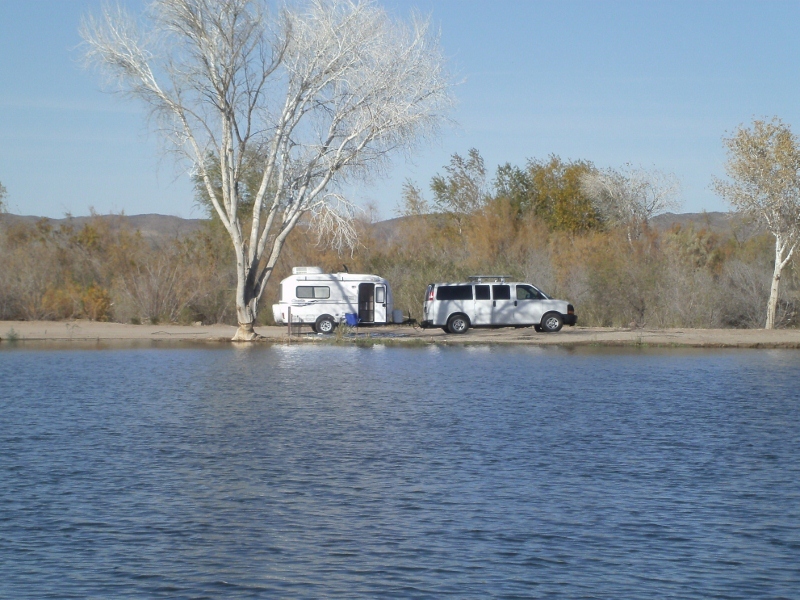 Your lake campsite is picture perfect….Enjoy it ! What I don’t understand is why a citizen of another country would think they have the right to impede a citizen of our country from enjoying that lake site. Perhaps you can enlighten me and I hope you do not decide to not post this. Knowledge is freedom. I can understand your point of view. The person is a citizen of this country, btw. I agree that camping sites should be shared, but I’m in an awkward position. Once I post this location, potentially thousands have the information and this is a very small place. 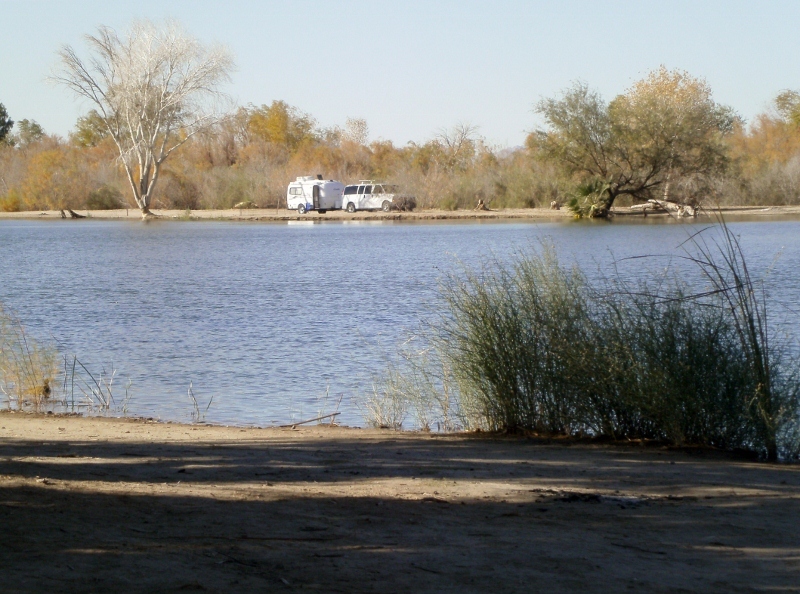 The Yuma area is wall-to-wall rvs. It’s not like sharing with a few close friends! The internet is very powerful. Happy New Year. I have just joined your blog, but have been following it for a month. I love your camping spot. We have three solar panels and most of our camping is boondocking. You get the best views that way. We leave in 13 days for our western trip and can’t wait to get on the road. Is it Diorothy or Dorothy? Welcome to my blog! Yeah, boondocking is the way to go . .. I love the freedom from campgrounds. I wish you safe travel on your western trip. Happy New Year! hey sue—-nice spot!! where exactly are you? and is this the spot fred put you on to?? I’ve addressed the issue of revealing my location above. Fred? no. Another wish for a Happy New Year, my dear blog friend. I’m thoroughly enjoying ‘Party of One’. It’s nice to know us “loners” are “normal” :). Thanks for recommending the book. I’m happy you are identifying with the people described in the book. Yes, we loners have always been the normal ones. It’s just that we’re in the minority, and the majority has ruled that we’re abnormal. Enjoy who you are. You have many gifts that nonloners will never have . . . Your good luck continues! Good find on the propane cover. Love the shot of the PTV and Casita across the lake. I still shake my head when I think of that propane cover sitting on the ground next to the PTV. There were miles of road I could have stopped at! What good luck to find that cover…hope all of 2012 goes that way (the finding, not the losing lol). Happy new year to you and the crew. Wow! I am getting excited about my own upcoming travel adventures. What a beautiful spot and I was thinking as I was reading about your propane cover…”she’s forgetting that she has a charmed life…it will show up” and sure enough by the time I finished reading your post, you had found it in the most unlikey spot. Thanks Sue for being you. Your comment gave me a chuckle! My “luck” or whatever it is, has been so good that now people can anticipate a happy ending to any problem that might arise. Too funny! Happy New Year! Hope it’s filled with fun adventures for you and the crew. My neighbor that I’ve told you about before that has the rat terrier has moved. 😦 Just a few miles down the road, but I won’t get to see her every night while she’s on her walk and I can’t believe how much I already miss her. Rat terriers do have a way of getting a hold on your heart. Thanks for your kind comment. May your dream come true!